Arcuri now a 'No' on healthcare? Update: This sounds a bit more uncertain. U.S. Rep. Michael Arcuri, D-Utica, said Tuesday he would vote against the Senate version of the health care bill that could soon go before the House of Representatives for approval. Why? Arcuri doesn't like the "mega bill" approach, the prospect of reconciliation, and some differences in the Senate bill. As his spokesman put it, "The congressman is very careful about evaluating each bill based on its own merits." Outside of Tompkins County, that may possibly help his re-election bid this fall. Inside of Tompkins County, well, it won't. I feel bad for Arcuri's Cortland Field Representative, Bob Messinger, who will be having office hours at Lansing Town Hall next Wednesday, March 10th, from 4:00pm to 6:00pm. When people fill out the census form, they 're helping to make sure that Tompkins County receives its fair share of federal and state dollars. Accurate data reflecting changes in our communities are crucial in apportioning seats in the U.S. House of Representatives and deciding how more than $400 billion per year is allocated around the country for projects like new hospitals and schools. Human service dollars are distributed based on population size, as are funds for highways and transportation systems such as TCAT. Starting March 19th... Tompkins County has 6 Questionnaire Assistance Centers (QAC). These walk-in centers will be available for those who have questions about completing the census form, need language assistance, or did not receive the questionnaire. The centers will have language guides in 59 languages. Staffed locations and hours are listed below. I was happy to get the long form in 2000. A Public Workshop will be held on March 22, 2010 at 7 PM at the Varna Community Center on the Draft Zoning Revisions. The draft documents can be viewed here. Comments received at the January 26th workshop are available here. Definitely take a look if you have a chance. The zoning is supposed tom implement the Comprehensive Plan (approved back in 2005), but the details are always important! 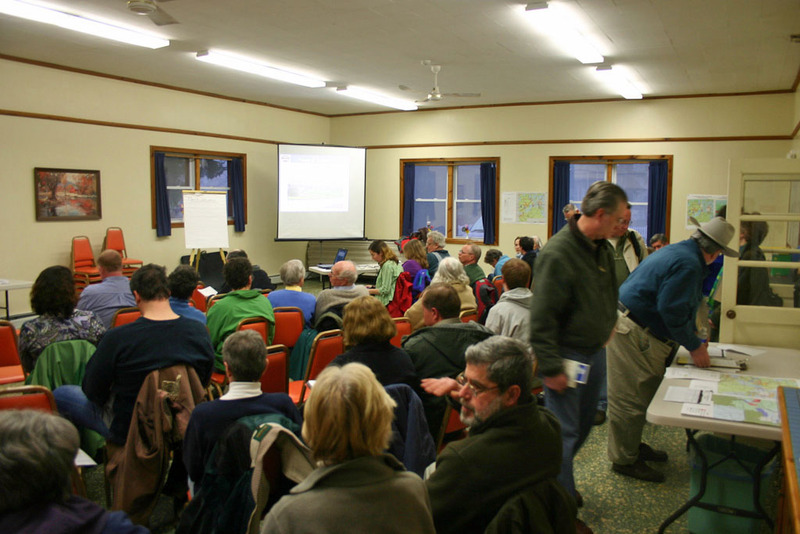 Last night's public workshop on the amended zoning law was almost as busy as the one held January in Dryden, with some familiar faces but also a lot of new people. Settling in at the Varna zoning meeting. Opponents of the law who'd spoken earlier - notably Bruno Schickel, who wrote an earlier op-ed and Ken Miller - were there, along with clusters of people from Sunset West Circle and the Varna area. Chip Ray, whose family owns Hillside Acres, opposed the law for what he saw as restrictions on unsubsidized affordable housing. Schickel did praise parts of the law - notably the Hamlet zoning and optional Neighborhood zoning, which allow more development - while opposing changes that limit scattered development. A number of speakers supported the law, one pointing out that his property values aren't simply a result of what he can do on his land, but of what neighbors do on their land. Mount Varna came up a few times as an abuse of land use. With the Varna II proposal in the background, there were a few questions about density and one about crime. My question was about the maximum density the plan allows, which turns out to be six units per acre in the Optional Traditional Neighborhood Development Overlay District, where units are one dwelling - house, apartment, townhouse, etc. Hamlet zoning, in areas with water and sewer, is just four units per acre. Partly I wanted to check my reading comprehension, and partly that just seems like a huge contrast with Varna II's proposed 16 units per acre. Stephen Lucente, the proposed Varna II developer, was at the meeting, but didn't speak. The Planning Board and Town Board hope to release a revised draft in May or June, so get comments in soon! Looking for things to do this spring? Cathy Wakeman has a list, from community gardening through tractors, a capella singing, and kids' sports. There's also note about a meeting on an Agricultural Resource Focus Area Plan, and the study itself is also available. I worry that much of the new farm work in Tompkins County is taking place outside the areas on which that focuses, but it's still useful information. Wonder what all the electrical construction has been lately? It's part of a transmission line upgrade binding Ithaca more tightly to the grid. It's kind of a horserace article, and it doesn't quite get as far west as Dryden, but I think this is a pretty clear portrait of the 24th Congressional District's current political state after Mike Arcuri's "no" vote on healthcare reform. When Republican lawmakers propose Upstate secession, they're usually arguing that it's for the cause of freedom, to get Upstate out from under the heel of those dreadful Downstate progressives. I've sympathized with the need for separation, but come at it from a very different angle. We are - Upstate is - a declining place. Our demographic trends have not been kind, as industry and opportunity left a place whose geography was no longer special. We are stuck in a strange world of hoping that Wall Street bonuses will be big this year so we don't have to cut 10% of our teachers, but have only limited abilities to find alternate approaches. We need to simplify, but are trapped in a place that still thinks of itself as the Empire State. All that remains of that imperial dream, really, is a still-triumphant Empire City. Yes, this would be difficult. A simple secession of either Upstate or Downtown would crash into all kinds of problems with the United States Constitution as well as internal politics and difficult questions about boundaries, universities, prisons, water systems, debts, and much more more. The closest we've come has been Spitzer's brief division of the Empire State Development Corporation into Upstate and Downstate sides - a division Paterson ended quickly. And yes, progressives in Upstate would no longer be able to enjoy the substantial political advantages of affiliation with the money and power of Downstate Democrats. We'd have to stand on our own two feet in a landscape that's suddenly gave conservatives more advantages. Not that it's all that conservative by national standards, actually, but much more conservative than New York State as a whole presently. We need to become able to make our own choices, breaking out of the sleep brought on by the sense that "you can't fight Albany" and the strange praying for Wall Street bonuses that comes up every year in budget season. We need to change things so that we pay for the work that happens here, and rebuild the sense that we are responsible for own fate. Let the Empire State fragment. We'll all be better off. These have already circulated for a while in paper, but you can now read (and sign) A Petition to the Dryden Town Board to Restore Home Rule and Petition for a Town of Dryden Industrial Noise Ordinance online. The first petition is about restoring control over mining and drilling operations to local municipalities - I believe the state took that over in the 1990s. The second petition asks that the Town "enact an ordinance to regulate noise associated with industrial activities".